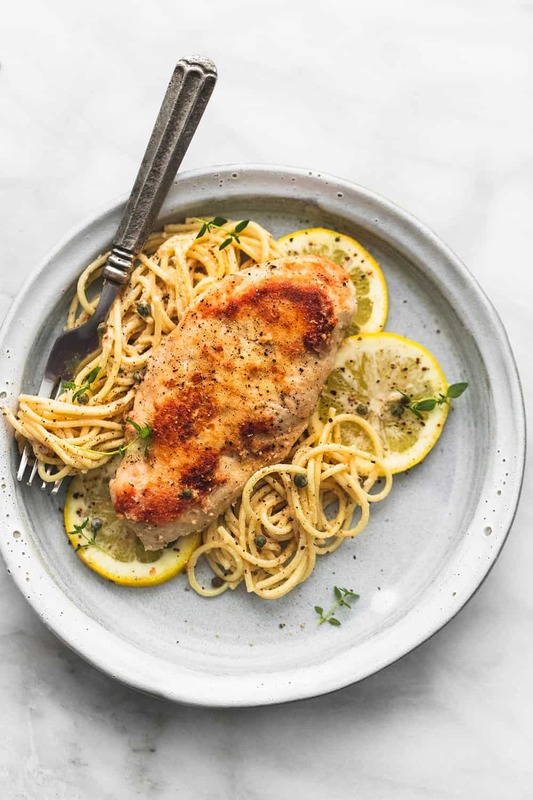 Slow Cooker Lemon Chicken Piccata is creamy lemony sauce-coated noodles with juicy lightly breaded chicken with a hint of garlic, all topped with savory capers! Hey guys it’s Tiffany from Creme de la Crumb!! Are you enjoying spring? It’s been pretty wet and dreary around here. We got a couple weeks at the beginning of March with gorgeous sunny 70 degree weather and then it evaporated into April showers. I’ll take it over the snow any day though! And rain or shine, a good crockpot dinner is always a good idea. 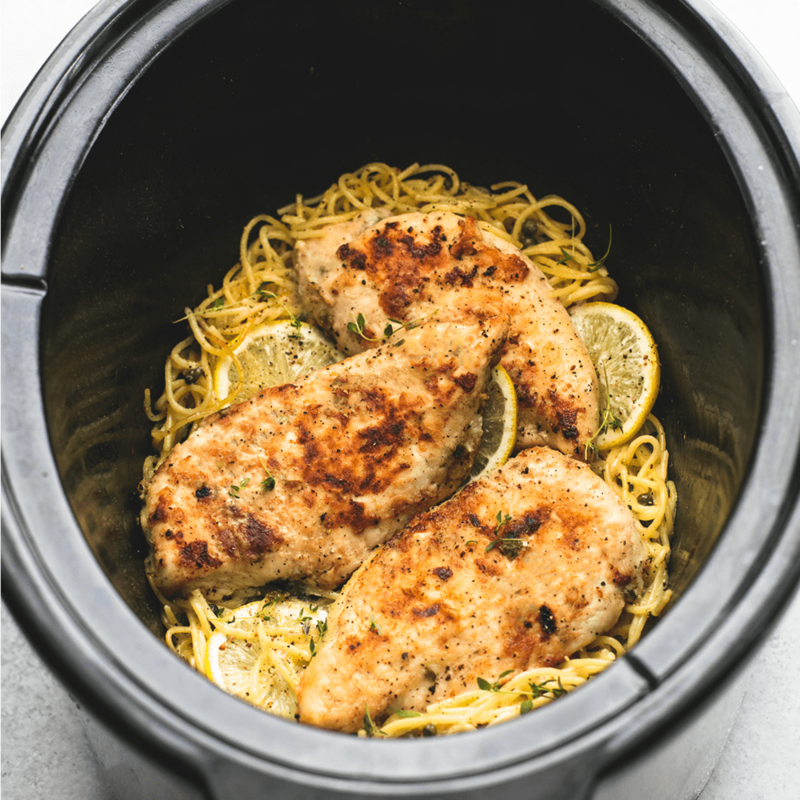 This slow cooker lemon chicken piccata is one of my family’s favorites! Creamy lemony sauce-coated noodles (linguine or spaghetti – take our pick!) with juicy lightly breaded chicken with a hint of garlic, all topped with savory capers! This dish is so easy to make, and even the noodles are cooked in the crockpot! Your family will fall in love with this delicious dinner! Whisk together flour, garlic powder, salt, and pepper. Dredge chicken in the flour mixture to coat on both sides. 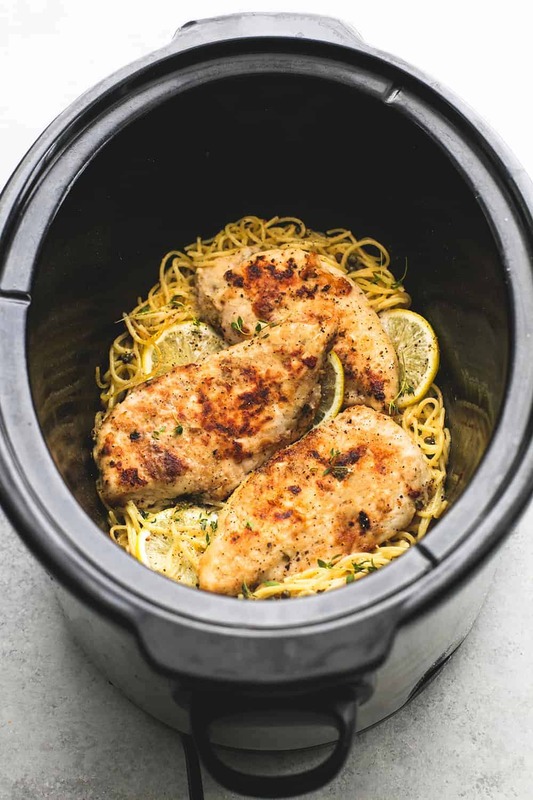 Grease a slow cooker, place chicken in a single layer in the slow cooker, cover and cook on low for 4 hours. Transfer chicken to a plate and cover. Add linguine to slow cooker, pour chicken broth over the top, cover and cook on high for 15 minutes. Uncover, stir in lemon juice, heavy cream, and salt and pepper to taste. Cook another 10 minutes on high. Add chicken back to slow cooker until hot throughout. Serve hot additional lemon slices and fresh thyme if desired. Enjoy! Thank you for this beauty. It is cold here (again) and this is just perfect for today’s dinner. The ingredients promise this will turn into a party 🙂 Thank you so much ! This sounds so good, I love a dish with lemon and capers and I thought I would try this out tonight. The chicken has been in the cooker for a few hours and Im getting everything else ready for it now and I didnt see where it said to add the capers? 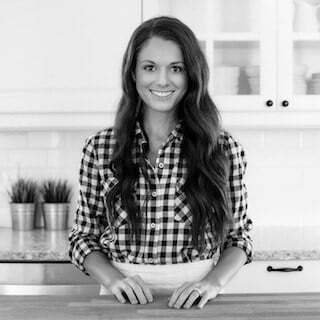 At this time I do not have any nutritional information on my recipes. I do recommend using myfitnesspal.com or an app similar to that and it will direct you to the information that you are seeking. Hope that helps! I have a silly question. Was I supposed to cook the noodles before putting them in the crock pot? 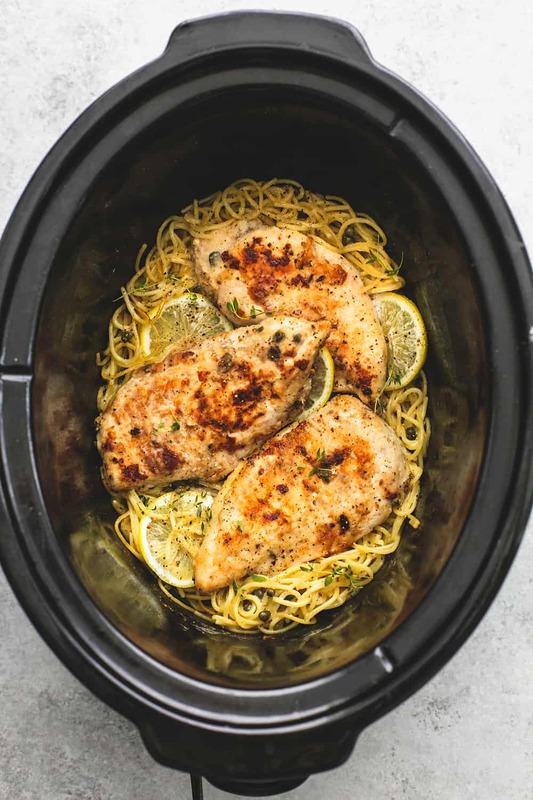 It does seem as though they do need to be cooked ahead of time; however, this recipe cooks the noodles in the crockpot! It is AMAZING! I just love it! Throw it ALL in and let the crockpot do the work! Hope that helps! My noodles have been in there for well over 30 minutes and they are still not cooked. ? I also had an issue with the cooking time for the noodles. I figured 30 mins would be enough considering the time given was 15. I think next time I will cook them as usual and then add to the crockpot. How long after I put this on high do I add the noodles? I’m using low carb angel hair. Dreamfields brand? I have the chicken in and put the capers in early by accident. But I love capers so I think it will be fine. Silly Question but there is a ton of liquid left over from the pasta. I’m supposed to drain that before I put the chicken back in right? Is the sauce supposed to liquidy or should it be thicker? We enjoyed this very much ! My husband said it’s a keeper ! I used Angel hair spaghetti, and heated the broth up. I am sorry, perhaps I read too quickly, but I missed the part regarding the capers. When do you add them in? During the cooking of the chicken or at the end. I am a little confuse. Otherwise, this looks like a fab recipe that I cannot wait to try. Thank you for your time and clarification. My linguine noodles turned to mush after the 15 minutes plus 10 minutes. What did I do wrong?! Can i speed this up by not usng low setting on crock pot for the chicken?